It wasn’t a wish, but on many of his birthdays, Lenny Scovel would take a minute and imagine the thoughts of a woman he’d never met. “I would wonder if my mother was out there somewhere thinking about me, perhaps saying, ‘Oh it’s my son’s birthday today,’” said Lenny, 52. Adopted as a baby, he never knew about his biological family, not even his ethnic origins. “All I knew was that I was born in Greenville, South Carolina in 1963 at St. Francis Catholic Hospital,” said Lenny, who runs a wedding business in Colorado. Whether his mother was wondering about him or not, isn’t known but there were people he didn’t know who were thinking about him. For decades, Karen Bumgarner and her brother Terry McCutchen searched for their siblings scattered across the United States. They referred to their lost brothers and sisters as their “family diaspora,” a moniker coined by the first found brother, Richard Frazier. They had no idea how to find him. This was long before the advent of direct-to-consumer genetic testing services like 23andMe. There seemed little hope that they’d ever find their brother. Although Lenny Scovel often wondered about his biological mother, he didn’t feel abandoned. He felt lucky to have been adopted and raised by a loving couple, Don and Mary Scovel. He just always wondered where he came from. 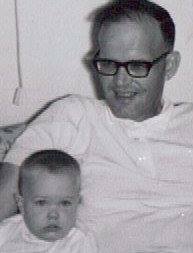 Lenny and his adoptive father Donald Scovel. After seeing the 2013 movie Philomena, a moving story about an Irish Catholic woman’s search for the son she gave up for adoption, Lenny redoubled his interest in finding out more about his origins, but it was his wife who helped push him along, purchasing a 23andMe kit for him as a Christmas gift in 2014. The thought was that at the very least, he would learn definitively what his ethnicity was. “Even the lack of an ethnic identity has been a gaping hole in me for 51 years,” he said. A few weeks later he did indeed learn about his ancestry – he didn’t just have English and Irish ancestry, but also Norwegian and a little Native American ancestry as well. Yet it was a connection with another 23andMe customer that sparked the revelation. 23andMe identified someone he initially thought was a cousin, named Tania B. This was the first time he’d ever connected to any biological relative. Tania confirmed that she was a relative but they weren’t cousins: Tania was likely his half-niece and her father was Lenny’s half-brother, Randy Bryan. Their mother, who’d been born in 1922, had died in 2000. She’d married at 19, had two children – Terry and Karen – but her husband was killed during the war. Jean married at least two more times, and had several children from several different men. But a lot of that information her children didn’t piece together until she was diagnosed with cancer. Her daughter Karen sat with her before she died and attempted to get from her a list of those lost children. One of the last things she told them was about a son, born in 1963 in South Carolina. It would be almost 15 years before they could find him with the help of 23andMe. For Lenny it was the fulfillment of a life long quest. 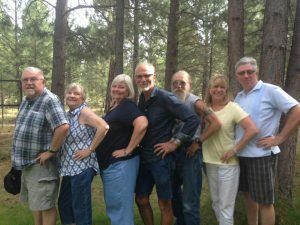 In June of 2015, seven of the twelve siblings met for what they called a “union-reunion” in the town of Sisters, Oregon. It was the first time Lenny was able to meet his brothers and sisters. “They were all ready for me,” he said. At the reunion, the siblings toasted their mother, talked about their lives and family, and pledged to continue to search for the siblings yet to be found.